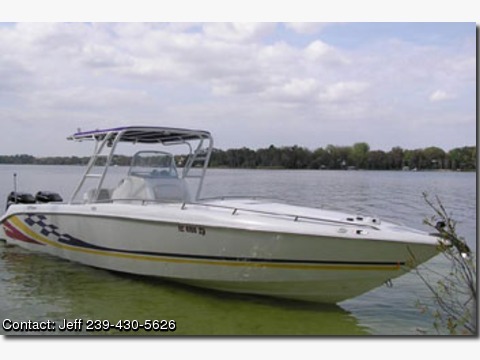 One new powerhead 2004, power tilt & trim, am/fm/cd, pop up cleats, garmin depthfinder 2004, gaffrig gauges, garmin gps 2004, 4 rocket launchers, 4 rod holders, new vhf 2004, hull warranty, non removable heavy duty canvas top on radar arch, k planes, The 340 SF featurs a bolstered leaning post plus 30 gal reciculating livewell, storage for 10 rods, dual in floor fishboxes, a built in tackle box and a textured cockpit innerliner with 360 degrees of fish fighting roam. The 340 sf also offers lots of storage for toys and gear, a forward v berth for two, an enclosed head with porta potty and a center console with hydraulic steering, kiekaefer controls and dual trim tabs. The huge cockpit has forward and aft seating and room for 10 passengers.